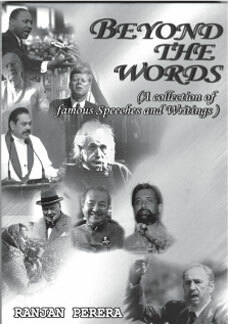 Ranjan Perera's latest book Beyond the Words is a collection of famous speeches and writings. The author has reined in a wide spectrum of speakers and writers to give the reader a slice of their thinking on various subjects. The book opens with Abraham Lincoln's famous Gettysburg address. It is not a long speech delivered by average politicians. It is a brief speech loaded with meaning delivered by one of the great US Presidents. All right-thinking people should read it for its sheer elegance of language and the message passed on to the future generations. Such a brilliant speech could come only from a statesman such as Abraham Lincoln. The next article written by Albert Einstein, the greatest physicist of the 20th century, is even more illuminating. The subject - religion and science - itself is controversial and can be handled only by a person of Albert Einstein's calibre. He concludes his erudite piece of writing saying," ... in this materialistic age of ours the serious scientific writers are the only profoundly religious people." The author should be commended for including the speeches of a few Sri Lankans in the book. For instance, Sir Arthur C. Clarke's 'My vision for Sri Lanka in 2048' is an eye-opener for many of us. Dubbed as a science visionary in his lifetime, Clarke predicted many future events accurately and most of them came true in later years. However, we have to wait for some more time to see whether his other predictions would come true. In this article Clarke gives a powerful message to the future generations. He says, "We who have spent all our lives in what I regard as the most savage century in known history have little moral right to tell our children how they should manage their affairs in the next century. But they can certainly benefit from our mistakes and ensure that they live in a century far better than mine." S. W. R. D. Bandaranaike who spearheaded the 1956 Revolution is well-known for his illuminating speeches. The author has included Bandaranaike's speech entitled, "Man must conquer himself" for the edification of the reader. Being an Oxford graduate and well-versed in Western Classical Culture, Bandaranaike's speeches are usually full of philosophical ideas. In the speech reproduced in the book, he says, "Man may conquer the world, he may conquer nature and he may even dominate the universe, but these victories will turn to dust and ashes, if he fails to make the last and most difficult conquest of all - conquest of himself." Bandaranaike reiterated the same ideas propounded by the Buddha and J. Krishnamurti. The Buddha was the first religious teacher to ask his followers to conquer themselves. Later on, Krishnamurti and a host of other Western philosophers echoed the same sentiments. The celebrated British philosopher Bertrand Russell's speech on "Shall we put an end to the human race?" is thought-provoking and timely. Almost all powerful countries are developing their arsenal and gearing for another confrontation with their enemies. Russell foresees the inevitable result in this mad rush for power and prestige. He says, "I appeal as a human being to human beings: Remember your humanity and forget the rest. If you can do so, the way lies open to a new paradise; if you cannot, nothing lies before you but universal death." Ranjan Perera has thought it fit to include a speech delivered by President Mahinda Rajapaksa. The speech was delivered by the President to mark the liberation of the Eastern Province from the clutches of the Tigers. He concludes the speech by saying, "...I am convinced this light would cause the historic brotherhood among the Sinhalese, Tamils and Muslims to sprout fresh shoots and thrive. Sri Lankans are living in peace today because of the President's timely intervention to eradicate terrorism. The author has included speeches and writings of many others such as US President Barack Obama, Dalai Lama, Fidel Castro, George W, Bush, Indira Gandhi, Jawaharlal Nehru, Mahatma Gandhi, J. R. Jayewardene and Swami Vivekananda. Some of the personalities are internationally known. However, a few relatively unknown people have been included in the book. The compilation of a book of this nature is no easy task. It is imperative that the author cannot afford to make mistakes or omissions. Although there are a few typographical errors, the book provides the reader with a new vision based on what great writers, statesmen and rulers say on different aspects of human life.